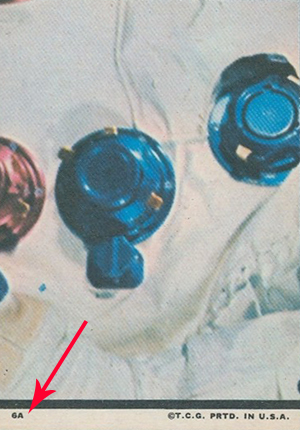 1969 Topps Man on the Moon trading cards give collectors a unique look at the Apollo 11 mission that resulted in "one small step for man, one giant leap for mankind." Besides the actual moon landing, the set documents the history, training, planning and behind-the-scenes work that went into it. 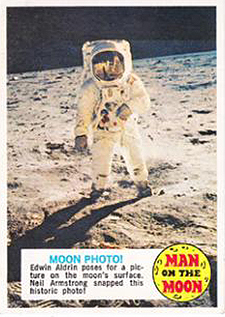 1969 Topps Man on the Moon was actually release in two separate issues. The first has 55 cards. The latter reissue, which was released in 1970, saw the checklist expand to 99 cards. This included the same 55 cards from the original release plus 44 new cards. However, the numbering is a little different. The initial issue and the reissue can be discerned on the card backs, even the first 55 cards. The first release had an 'A' or a 'B' after each number (1A, 2A, 54B, etc) to discern what puzzle it forms. For the reissue, all 99 cards are numbered 'of 99' (1 of 99, 2 of 99, 54 of 99, etc). Much of the first set is dedicated to the work that went into the mission. Collectors can go behind the scenes at NASA to look at the astronauts' training regiment, their equipment and practice runs leading up to the Apollo 11 space mission. The updated reissue delves more into the flight and subsequent moon walk. It includes several iconic images that remain instantly recognizable today. Timely then, 1969 Topps Man on the Moon has become something of a time capsule that still offers a lot of historical insight today. You can see the entire first set here. Card fronts are simple with a large image dominating the overall appearance. 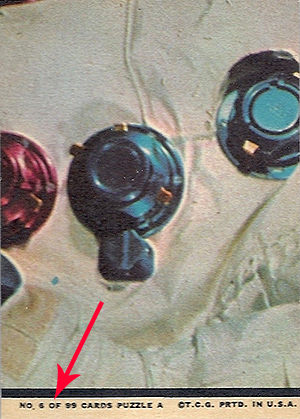 A small white ribbon towards the bottom of the card has both the caption and a short writeup describing the who and what in the image. A custom Man on the Moon icon sits next to it. Card backs are puzzle pieces. 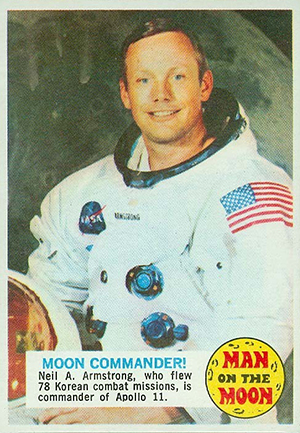 Today, 1969 Topps Man on the Moon remains popular with both card collectors and space collectors. Singles are not terribly tough to find, nor are they very expensive. Professionally graded copies can go for large amounts, but most are much more modest. Putting a set together will take some patience, particularly if you're picky about condition, but it's certainly attainable. 10A "All Hands On Deck"
7 of 99 "Apollo 8 Success"
10 of 99 "All Hands on Deck"
19 of 99 Launching Pad! 21 of 99 The Apollo Camera! 36 of 99 "Welcome Home"
39 of 99 The Saturn V! I have about 88 of these cards, of the first 54 I have 51 of the original issue. The rest are the second issue up to 99. (Probably threw away the reissue ones since I already have the card/picture piece.) I have had these since I have been a boy. Also a few of the Apollo glasses that marathon gas used to give out. I have the 5 cards on the right hand side of your page. Good to see these may me worth something.